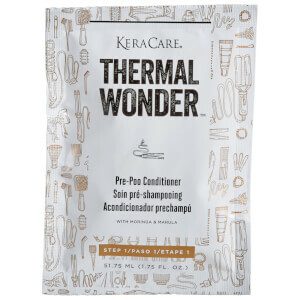 Protect, smooth and hydrate your hair with KeraCare Thermal Wonder 6 in 1 Thermal Protector, a heat protective spray with multi-functional benefits. Working to seal, protect and straighten your hair, the versatile solution contains a host of botanical extracts and moisturising Moringa and Marula to effectively hydrate, detangle and control frizz. Delivering unrivalled heat protection, the formula can be used as a leave-in conditioner, or applied before straightening and blow drying to keep hair safe from damage and protected against humidity to promote long-lasting, polka-straight locks. 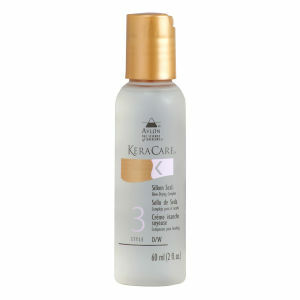 Sealing the cuticle, the formula will leave hair looking smooth and silky with restored moisture and shine. Can be used on wet or dry hair. The third step in your Thermal Wonder™ routine. You should apply the styler to your hair prior to blow-drying and then again before flat-ironing. For blow drying, mist entire head and gently comb through to the ends. Blow-dry using medium-high heat. For flat-ironing, spray liberally onto individual half inch sections and comb through just prior to applying heat. Maximum of 200°C for thick, coarse hair. I have medium course/4B hair, it's kind of frizzy/fine at the same time. I have tried everything to try to make the texture sleeker and less frizzy.This product made my hair moisture, frizz-free, lightweight and really shine. I have medium fine hair that has a strange texture, it's kind of frizzy/fuzzy. I have tried everything to try to make the texture sleeker and less fuzzy, it may work on the day that I have washed my hair but the next day it is just back to normal. The Keracare range has made a massive difference to my hair, I use the shampoo and conditioner and this spray helps me get the combe through my hair after washing and actually leaves my blonde hair with a shine and so soft! I can't see me ever using a different range which is going to save me fortunes and I can't believe I have finally found a range that suits my weird hair!!!! I buy this product afraid of just left my hair really sticky, but no! My hair is really shinny and loose. I get a really soft hair this morning after a few months. My new favorite product.